The title of this game sounds like a dream and if you get lucky on this slot machine perhaps this is the dream that would come true for you. Play the reels with the symbols of paradise; a cocktail in the sunset, the dolphins in the sea and a beach filled with gorgeous women. The Lifeguard symbol substitutes for all other symbols, except for the Airplane, and if substituting – it will pay times 2. You will be awarded 25, 35 or 45 bonus games by getting 3, 4 or 5 Airplane symbols. Even better, you can re-trigger the bonus feature while you are in it and stay in paradise even longer. 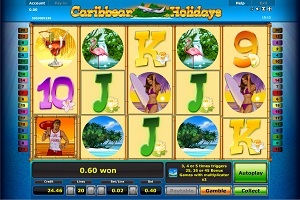 Graphics & Appearance: Caribbean Holiday is a very tempting slot machine, filled with symbols from a tropical paradise. The colouring is light blue with variations in the “sunset-coloured” cocktail symbol, the pink Flamingo and the purple bikini girl with the surfboard. The game window is very easy to navigate and the paytable is easy to understand. Gamble Feature: The gamble feature is a 50/50 chance when you climb your way towards the top and double your winnings as you go along. If you win, you always have the option to collect the money and return to the game or continue your gamble to reach the fortunes and risk your winnings. Game Symbols: The Lifeguard symbol will substitute for all symbols except the Airplane symbol. The winnings will be double when the Lifeguard is substituting. The Airplane symbol will trigger 25, 35 or 45 bonus games if you hit 3, 4 or 5 of them. You will also see symbols like the Surf Girl, the Dolphin, the Flamingo, a Cocktail and the Beach symbol. The lower paying symbols are the 9, 10, Jack, Queen, King and the Ace. Bonus Feature: You will unblock the Bonus Games by hitting 3, 4 or 5 Airplane symbols and be sequentially awarded 25, 35 or 45 bonus games. You will also be able to re-trigger the Bonus Games while already in the Bonus Feature. Betting Options: Caribbean Holiday offers you 5, 10 or 20 paylines across 5 reels. You can configure your stake preference by using the + and – symbols. Game Features: The Caribbean Holiday slots offer the Autoplay feature where you simply just sit back and let the machine do all the work. The gamble feature is not accessible for you while using the Autoplay. « More slotmachines guides Article last updated: Friday, August 17, 2012.